Aaarrhh. Extra Virgin, Virgin, Olive oil, Pure, Light, Pomace. So many olive oils to choose from but what’s the difference? There are nearly 3 million tonnes of olive oil made each year throughout the world. These oils are made in large modern mills like those owned by the likes of Boundary Bend in Australia, the Californian Olive Ranch and the large co-op mills in Spain, through to the thousands of often antique presses of rural Italy, Tunisia and Morocco. These processors have different levels of technical expertise and financial resources (as well as different ‘care factors’) so the resultant oils range from being sensational through to downright inedible. The bulk olive oil trade has developed a well defined set of grades to accommodate these quality differences (extra virgin, virgin, ordinary virgin and lampante).While often mentioned by dozens of blogs and websites, these classifications have little relevance to the actual consumer as all but the highest grades undergo further processing and eventually end up in retail stores under more completely different names such as ‘olive oil’ ,’pure’ or ‘light’ olive oils. This is the stuff we buy, but what are they? and how do they differ from the more expensive extra virgin olive oils. Regardless of what clever attractive names the marketing people have come up with, all olive oils fall into two distinct categories: unrefined and refined (not as in George Cluny vs. Ozzie Osborne type of refined – but the oil refinery type of refined). Extra virgin olive oil is the only commonly encountered grade of olive oil which is unrefined. Simply put, it is oil that has been extracted from fresh, good quality olives solely using a mechanical process of some sort. The mechanism may be a press, but these days olive oil is usually extracted by the action of spinning the lighter oil away from the heavier water and ‘olive bits’ using a high speed centrifuge. Have you ever made orange juice at home using one of those juicing machines? You just put the fruit in and the juice comes out. You didn’t add anything or do anything special. Well that’s how extra virgin olive oil is made. It’s just that in this case, the juice is oily. The olive oils which are marketed under the names of “Olive oil”, “Pure Olive Oil” and “Light Olive Oil” are refined olive oils. Remember when I said that some of the oils which initially came out of the mechanical extraction process were so bad that they were unsaleable?… well these can be ‘cleaned’ up into a saleable state using a process called refining. Amongst other things, refining involves steps designed to deodorise the oil – a nice way of saying stripping out all the crap aromas and flavours in order to make the oil edible. However, the deodorising process also takes out the good aromas and flavours together with most of the health giving micro-nutrients such as the polyphenols that the oil might have had. Finally as the polyphenols which also double up as natural preservatives are removed by refining, artificial antioxidants such as Butylated hydroxytoluene (BHT)and butylated hydroxyanisole (BHA) must be added to give them a commercially adequate shelf life. (Incidentally all refined edible oils including vegetable and canola are artificially preserved in this way). The lowest quality grade of olive is called pomace oil, or in some countries, refined pomace oil. The olive waste (skin, mashed pips) that remains after the mechanical extraction step contains a small amount of oil. This oil is extracted in large industrial installations using solvents which are then boiled off to leave a crude oil which is then refined. . All olive oils have a high level of monounsaturated fat regardless of whether they have been refined or not. The end result of this additional processing is that all refined oils (Olive oil, Pure, Light, Pomace) have little or no olive aroma, flavour or colour (what they have gets there via blending in few percent of an extra virgin oil). They also have no bitterness or pepperyness. While they contain the same amount of heart healthy monounsaturated fats as extra virgin olive oil, they lack the important antioxidants and anti-inflammatories which make extra virgin oil so special. So why do people buy them? For the user who is keen on cooking with a heart healthy monounsaturated fat, but doesn’t want to impart an olivey flavour (when cooking French fries for example), then a refined olive oil is an option. Refined oils also have higher smoke points than non-refined oils which make them more suitable for deep frying (more on this in a forthcoming blog). 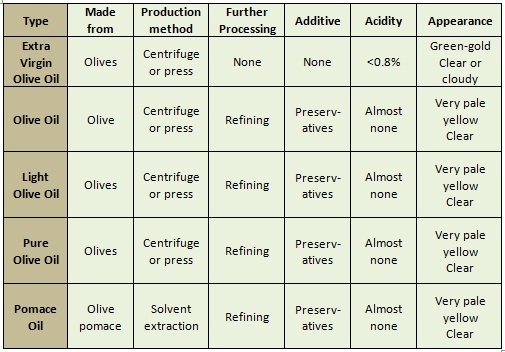 The following tables summarise the difference between the different types of olive oil which are widely available.